Are you looking for a really cute brunch or dinner idea? The answer must be these egg, hash brown, and cheesy scramble cups. 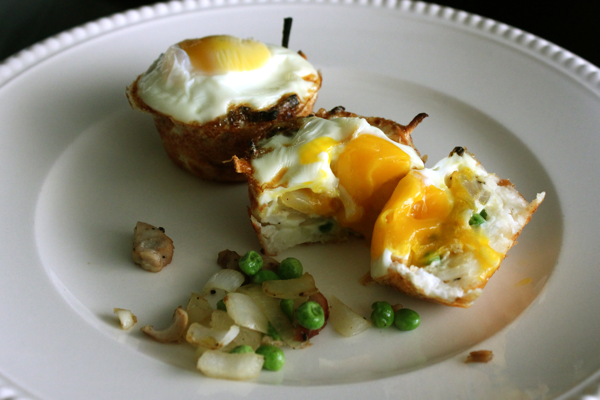 They have everything you need for a filling meal all layered in a single breakfast muffin. These babies are so unique and fun to eat. 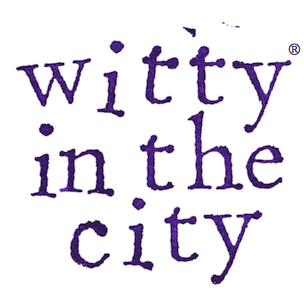 They will be a regular around here! To make 6 portions (which should serve 2-3 people), defrost 1 1/2 cups of frozen, shredded potatoes. Then, preheat your oven to 475°F. Mix the potatoes with 1 tablespoon of melted butter, 1 egg white, salt, and pepper. Grease 6 cups in a regular sized muffin tin. Then, line each of the 6 muffin tins with 1/4 cup of the potato mixture. Press the potatoes into the bottom and sides of the cups. Bake the tin for 15 minutes. While the potatoes are baking, heat some oil in a pan and soften 1/4 of a chopped onion, 1 minced garlic clove, and 1/4 cup of frozen peas. I also added in some chopped, leftover chicken. Bacon or sausage would also be really delicious! Season the scramble with salt and pepper. Spoon some of the scrambled mixture into each of the muffin tins on top of the potatoes. Sprinkle on some shredded cheese (I used cheddar), and return the tin to the oven for 2 minutes so the cheese can melt. 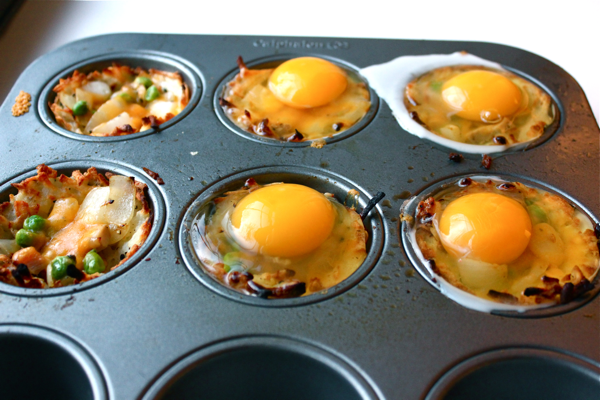 Remove the tin from the oven, and crack 1 egg into each of the muffin cups. Bake the tin for 9 minutes for a perfectly soft egg yolk. Cook the eggs for 8 minutes if you want the yolks to be runnier and for 10 minutes if you like them to be more solid. 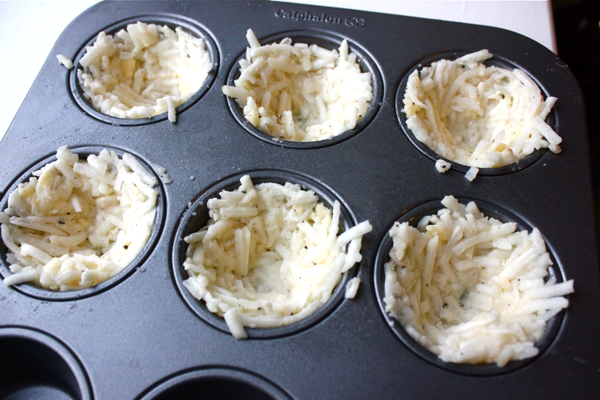 Use a fork or spoon to pop the hash brown and egg cups out of the muffin tin and serve them immediately. Yum yum yum! This recipe was adapted from Martha Stewart’s Everyday Food magazine. I just saw a Rachael Ray recipe for eggs in clouds. I’m not sure how they will taste, this looks like a guarantee hit. I made this as a late dinner/use what you have meal. First, I didn’t have frozen hashbrowns, so I just diced up some potato…it worked okay, but I won’t make it like that again. 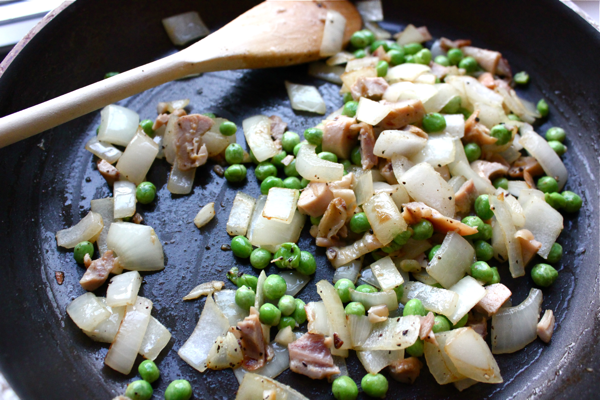 I don’t eat peas, so I used instead some bacon bits, canadian bacon (chopped up) and some sasuage bits (leftover pizza topping) It was great, next time I will make sure I have frozen hashbrowns though! Also, I was lazy and just sprayed the cupcake pan with Pam…that was a mistake. Eggs didn’t come out very well. Luckily it was just for me, but next time I will proprly grease the tins. Just made this last weekend and it was awesome! I shredded fresh potato and used green beans instead of peas and it was awesome! My son gobbled it up as did his Daddy. Great recipe (as usual)! I haven’t made these in a while, but you’re making me hungry! Absolutely great! Surprised my wife and her sister with these and bourbon peach french toast one morning during her visit… They LOVED it!